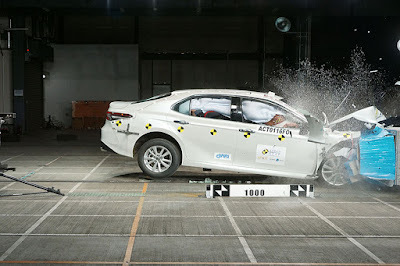 The ASEAN NCAP has released the crash test results of the 2019 Camry and it comes as no surprise that Toyota’s newest executive sedan scored a 5 out of 5 safety rating. The all-new Camry scored 91.47 out of 100 which is good for a 5-star ASEAN NCAP rating. Fitted with 7 airbags as standard and underpinned by the robust Toyota New Global Architecture or TNGA platform, the 2019 Camry scored an impressive 49.04 out of 50 points in the Adult Occupant Protection (AOP) and 22.68 out of 25 in the Child Occupant Protection (COP). Capping off its impressive crash safety is its impressive array of safety assist features that scored it 19.75 out of 25. It’s worth noting though that the model tested by the ASEAN NCAP came equipped with both blind spot indicators and advanced safety assist technology. These technologies come standard in Thailand, Brunei, and Malaysia while it’s not equipped in models sold in Singapore and the Philippines. Without these technologies, the Camry’s score will drop by 3.22 percent.